Expect a great time! Awesome place! Lovely cabin surrounded by beautiful trees. Great amenities. Short drive from town (scenic too!). A great place to stay in Seward! A cute and clean cabin and a convenient location to be able to explore the area. This is the second time I’ve stayed at the Serenity by the Sea cabin, and it’s so lovely! I love how it’s tucked away in the woods, and then has such easy access to those gorgeous black sand beaches and vistas of the mountains all around the bay. It’s cosy and quiet, and the cabin has everything I needed, including a nice and efficient kitchen. Thanks again for the amazing hospitality! Wonderfully comfortable and cozy cabin a short walk from the waterfront in Lowell Point. The cabin was clean and the perfect size for a solo traveler! The gas heater/fireplace was an extra cozy addition, and kept the cabin nice and toasty, even though I visited in early December! I only had a very short stay, but was nonetheless able to enjoy the spectacular scenery afforded in Seward and Lowell Point. Recommended is the trail to Tonsina Point, which offers spectacular views of Resurrection Bay and the surrounding mountains. Thanks for a lovely, albeit short stay! cute cottage and had everything we needed. I can’t emphasize the positives enough. This little house is spotless, so cute, and QUIET! The gorgeous, moss-covered woods dampen any noise so you truly feel at peace. The beach is fantastic to walk and the view can’t be beat. Directions were simple and accurate, and I had everything I needed for a quick work trip, but I am keeping this place on my list for a romantic weekend getaway. Loved it! We enjoyed our stay here. The cabin was bigger than we thought! The Millanes provided more than we needed so that was a bonus. I enjoyed all the thoughtful touches also. Would definitely come back again. Although this is one of a small cluster of cabins, it is very quiet, and you might see a bear wander by or wake up to the sound of eagles (as I was). It is convenient to the beach and the best trail head, and only a short drive to town. This is a dog friendly place (emphasis on friendly!) but a great place to stay with or without your furry friend. I will definitely be back! The photos accurately depict the cabin. The stairs to the upper loft are steep - probably not good for young children or if your eyesight/balance/coordination is not good. Which was a nice surprise was the size of and finishes to the bathroom - the shower is roomy and you don't have to worry about trying to squeeze into one of those small telephone booth sized things. Water pressure and temperature were good. Wonderful hosts and a pleasure to had been able to talk with over my time there. Location is great with access to a lot of hiking while avoiding the bustle of midtown. Thoroughly pleased with my stay. Very good host family. Everything ready, clean, and welcoming. One word of caution: the ladder to the upstairs sleeping area is very steep and may not be safe for use by children or the elderly. This is a great little cabin, and considering the location it’s a great price. We had everything we needed, and enjoyed the cozy space. We would definitely stay here again. Bear glacier cabin was a cozy "home away from home" for our family of five (two teenage sons and 11 year old daughter). We were comfortable here for three nights and happy to be outside of downtown Seward. The cabin is space efficient and functional in every way. Meal times were a little tight between the kitchenette and dining space for four, but we easily made it work. It was great that everyone had their own space (private bedroom for parents, boys up in the loft, and daughter on the futon). We will happily stay here again if/when our travels bring us back to Alaska. Great little cabin in the woods. It was very cute, warm and fun for us to come home to. A little tight for 6 women but we made it work. Would maybe be better for family with kids. But it was much better than a hotel in Seward, and fun to be out of town along the water. Kitchen and shower were great, Wi-Fi a little spotty. There is no oven, which it might have said in the write-up but if so we missed it. Still, great to be able to put up a pot of noodles after a day on the water. Would definitely recommend! Thank you fo sharing your corner of Alaska! We took our family of 5 to Seward and stayed four nights. The cabin is little but cozy and warm. We just loved coming back at the end of the day to make dinner and relax. It's a little off the beaten path and the tree cover made those long summer nights easier to get to sleep. It was pretty rainy during our stay so we didn't get to use the outdoor spaces, except the grill. Just down the road was easy access to the beach. We had no issues during our stay so we didn't need to contact the owner. All in all we were super happy with our stay and the cabin. Wonderful cabin in the woods of Lowell point. Great host. Available for your every need and also allows you to have peace and quiet. Highly recommended place and host. Thank you so much! This cabin is beautiful and cozy. The drive out from Seward is gorgeous (but take it slowly). The cabin is efficient and comfortable. What a fantastic cabin in the beautiful Seward countryside. Definitely the place to stay when visiting Seward! This is a wonderful location in the pines just far enough away from town to give us the rest and recharge we needed after a day of hiking and boat tours. "Great trip, good fishing and the cabin made an excellent base camp. Would definitely return. The cabin was nicely decorated, popcorn and other touches were nice and space used well. We would return again. " Colin and John, SLC UT. Just Wow! Charming little cabin about a 15 minute drive from the harbor. We had an amazing time staying here and felt secluded even though the town is only a short drive away. Thank you Millane for everything! Great stay in Seward, the property was well equipped for a comfortable stay and great community amenities to spend time outside. It was about a 7 minute drive back into town. 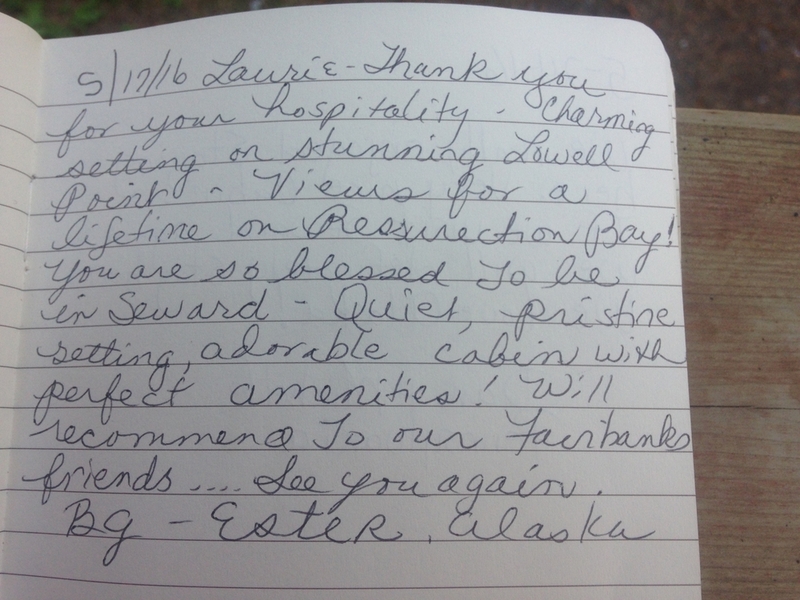 "The Exit Glacier cabin was perfect for us. Great location by the sea and no crowds. I am glad we chose to stay here. We will be back!!!" "The Serenity cabins by the sea were perfect accommodations for the final leg of our Alaska trip. The Exit Glacier cabin was so comfy and much roomier than it appeared. You've truly thought of everything, form the shampoo/condition dispenser in the bathroom, to the collection of DVD's for rainy days, to everything in the kitchen we could possibly need. (P.S. if you are looking for the silverware, check the table by the window- it has drawers on the side) We've had an amazing time on our trip and hop to visit Seward, and the cabins, again in the future. Cabin with loft for a teenager. Friendly owners and comfortable lodging. We liked the unique heating unit and stylish bathroom. Property itself is nice but access is hampered by a substandard muddy, severely potholed "road" from town that Seward does a horrible job of maintaining. Every time it rains (which is often), the road deteriorates into a suspension killing adventure. It is not fair that these properties and their guests must put up with this substandard maintenance. 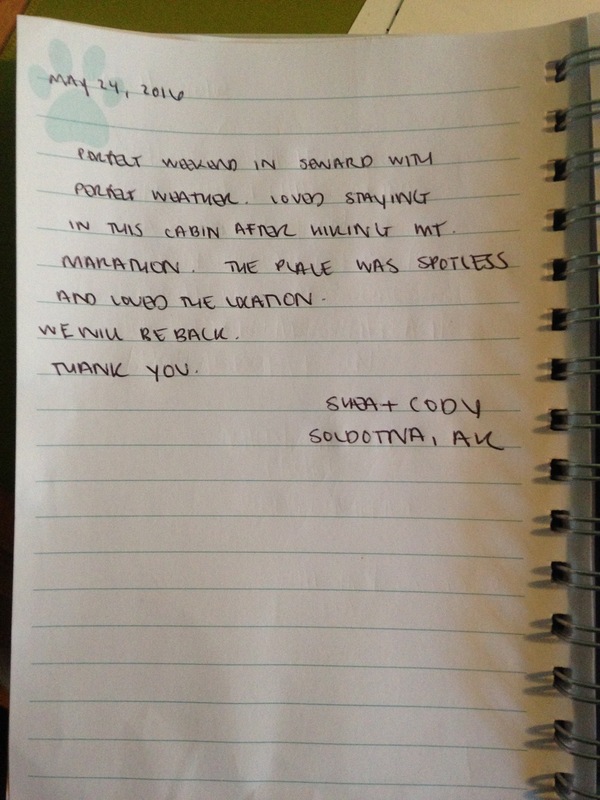 Thanks so much for the wonderful review of our cabins. We're glad to hear your stay was great! It sounds as if your visit was during a time of particularly poor road conditions. We did have a period last summer where we experienced heavy rain and the road bed was washed out to the bedrock. We agree! It was terrible! The good news is that since then the City of Seward has added materials to the 1.5 mile of gravel road to Lowell Point and the road is in much better condition. While we do still see some potholes when there are longer periods of heavy rain, in general the road is holding up so much better. Rumor has it the City has plans for even more additional bed work before next summer. Thanks for sharing your honest feedback and we look forward to your next visit! MSbtSC did a great job outfitting the cabins to meet the needs of renters. Lots of thoughtful items were there as well as comfy beds in a cozy spot. Good walks/hikes nearby and convenient to kayaking in Resurrection Bay. I would recommend staying there and would stay there again if in Seward. Walk to the beach and Millers Landing. A ways out from town so recommend a rental car. If renting a car in Seward, be prepared, they're expensive, buy hey, everything is expensive here. The owners are great, place id clean. Nice that coffee is provided. The cabin was stocked with useful items to help a family cook meals and be comfortable. The owners were very nice and check in was simple. I would recommend this location for any family. We were able to walk to the water and had easy access to hiking and the city of Seward. Sweet, small cabin, with everything that we needed. Quiet area and off the beaten track. No check-in contact made, which made things simple, a little unfriendly, but not a big deal, really. Screens were missing from a couple of windows, but having windows open didn't fill room with pests. We were happy with our stay. We loved the puzzles and videos in the cabin. Thanks for taking a moment to share info about your stay with us and with the TripAdvisor community! We're sorry we missed you at check in. We're usually around, but do keep the cabins as self check in so folks can have the flexibility to show up and just settle in whenever is convenient. Alaska travel plans can be very fluid and folks seem to appreciate the flexibility. We did replace the missing window screen, and luckily we don't have much of a mosquito problem so close to the beach. Thanks for visiting...and we hope to meet again! The only negative I can share about this place is that we didn't stay long enough! It was an incredible place to stay to allow for an experience in Seward. We took a glacier cruise, which is highly recommended, walked the beach, amazing scenery, and went to the souvenir shops. A trip to Alaska would not be complete without staying here!! Great cozy getaway for two! We used this rental for our honeymoon and it was a great place to stay while checking out all the great outdoor opportunities of Seward. The cabins are close together but that doesn't detract from the seclusion that you'll feel. Great location away from town...but not too far away. It was very quiet in the area. The owners are very relaxed and willing to help if you need them, but they also don't bother you if you don't need them. They were very kind to let us check in early after a red eye flight into Anchorage. We had 3 adults, an 11 & 13 year old staying in the Bear Glacier Cabin; it was "cozy," but enough space. There's a nice grocery store in Seward where you can buy groceries and cook if you want to save some money (restaurants in Alaska in general are pricey!). The cabin was very neat and an enjoyable stay. We booked several months in advance and definitely preferred staying here to hotel in town. I'd definitely recommend. This is a tiny little cabin but it is really cute and very clean. It is in a great location. We could walk to the beach or to Miller's Landing for kayaking, fishing, cleaning laundry, etc. The kids loved the twin beds in the loft. The area was so quiet and relaxing. We had extra food left over. When we asked the owners what we should do with it, they told us they donated it to the local guides at Miller's Landing. We thought that was great. Also, one of our kids left something behind. We had no idea it was missing until we received it in the mail. That was so nice! We did have an issue with our water heater one morning but the owner was over in less than 5 minutes to fix it. He fixed it in no time and we didn't have any other issues. The service and friendliness and honesty of the owners/caretakers was so refreshing and much appreciated. "I visited these cabins to spend New Year's Eve in Seward. Super cute and comfortable place. Everything was clean and the check in and check out process could not have been any easier. The host was super responsive and we had no issues. It is a small cabin but was ideal for our purposes as we just needed a place to sleep after the days adventures. We had 4 people and two dogs. Would totally recommend to anyone visiting Seward!" "Everything was perfect. We had three in our party and our daughter enjoyed the large loft where's he stored all her things. On the main level their was plenty of storage, comfortable bed, amazingly redone bathroom and kitchen very consolidated but they thought of everything you might need and it was there. I can't imagine a better place to stay in Alaska to get the real feel of the place. The location was also great for all of the things that we did and convenient to come back to during the day for short breaks from trying to do so much. We definitely plan to go back and there is no question about where we will stay. Book your stay there - you won't be sorry!! " Stayed August 2015, traveled with family. Lowell Point is a great location and very scenic. The location of the cabins is outstanding (a block from Resurrection Bay back in the woods. If you want a cabin that has what you need a few things that are nice to have, this is the place to be. The owners are great people to work with too.